What little kid doesn't want to fly a spaceship and use rocket packs to jet around? And every kid wants to make friends with cowboys and cowgirls, Mr.Potato Head, slinky dog, horses, piggy banks, not to mention dinosaurs. Those are by far the coolest folks anyone on this planet could know! Buzz truly has the life, not having to eat vegetables, flying with a jet pack, always having the best lines in Toy Story movies! This costume will make space exploration way easier with it's "can do" attitude. 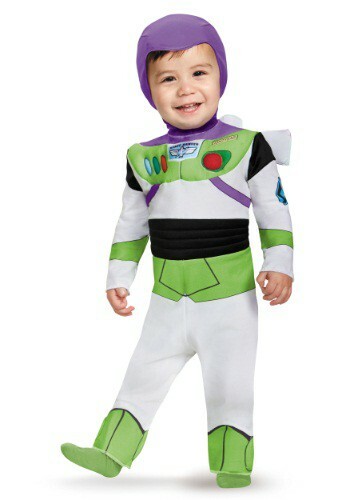 The tot wearing this will obliviously absorb all off Buzz's coolness just by wearing this garb. "To infinity and beyond!" is what we hope the little one wearing this Buzz Lightyear will be shouting! Going on adventures to far, far, away galaxies will be a new priority for Star Command's newest, hippest, action star. Making the leap to space traveler will be a big step. Will your new Buzz be ready to fill those shoes? Star Command only uses the finest polyester for those nights Buzz just wants to dance, and uses quilted foam on the chest and pant cuffs for that awe inspiring 3D look. So, Buzz doesn't lose his head, the hood fastens with Velcro under the chin. You know what the most important part is? The jet pack! It Velcros to the back of the suit for extra fast flying. Watch out though... you might not be able to keep up with Buzz, after all in this costume there will be lots of buzzing around! I carefully measured according to size chart and measurement instructions. My suit is off by about 2cm - which would have made all the difference. Now have a costume that doesn't fit and a birthday boy without a costume. Disappointed.